I believe in the good work of Royal Columbian. This cardiac team saved my husband during a heart attack. Their quick and experienced work saved his life. I am honored to contribute to continuing this vital work. Join the fight to find hope in a heartbeat. 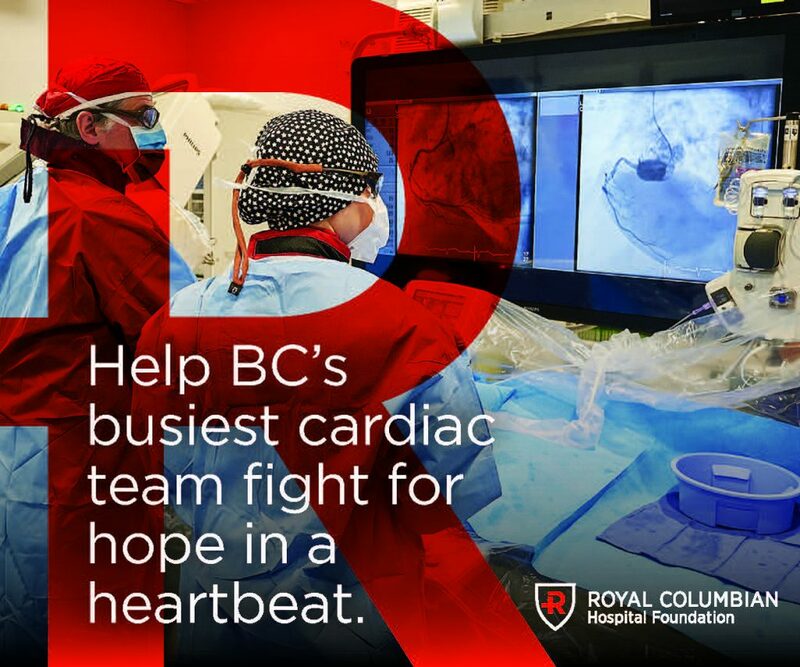 February is Heart Month, and your donation now towards cardiac care will support as many as a third of British Columbians who rely on Royal Columbian Hospital for heart-related emergencies. Thousands of patients come through the doors of the hospital each year, looking to retain quality of life through complex open-heart surgery or the latest minimally-invasive measures to open blocked arteries, replace failing heart valves and diagnose heart conditions. We have a team of expert cardiologists, cardiac surgeons, cardiac anaesthetists, perfusionists, nurses and other health care professionals who offer care from diagnostics to treatment and support in the community once you leave the hospital. Royal Columbian Hospital serves as the region’s emergency room for the heart. Your contribution towards cardiac care will help to ensure Royal Columbian can continue to deliver exceptional services. Your gift can support the purchase of lifesaving equipment such as defibrillators. When time is critical and a patient requires immediate resuscitation, every second counts. Royal Columbian Hospital’s Code Blue Team is a specialized group, composed of health care professionals, that rush to the location of distressed patients in the hospital and start immediate resuscitative efforts.